US Ambassador to the UN Nikki Haley took a page out of the Obama administration's playbook on Monday, claiming that the Syrian people no longer want to see President Bashar Assad as their leader. The Syrian president's inevitable response is easy to predict. Speaking to reporters on Monday, Haley blasted Assad, stating that Secretary of State Rex Tillerson's recent comments that the president's status would be decided by the Syrian people did not mean that Washington would see it acceptable for him to participate in future elections. "We don't think the people want Assad anymore. We don't think he is going to be someone that people will want to have," Haley said. "We have no love for Assad. We've made that very clear. We think that he has been a hindrance to peace for a long time. He's a war criminal. What he's done to his people is nothing more than disgusting," she added. Speaking to ABC News a day earlier, the former South Carolina governor-turned UN ambassador went further, saying that "bring[ing] Assad to justice" "remains a priority" for the United States, and that the US would put pressure on Moscow and Tehran over their stance on Syria. "…We need to start putting pressure on Russia and Iran," Haley said. "We need to get the Iranian influence out of there….We want Russia to know how dangerous it is for Assad to remain in power." Also on Monday, Europe's foreign ministers issued a communique which said that while their country's future would be for Syrians to decide, the EU's position remains "that there can be no lasting peace in Syria under the current regime." For her part, EU bloc foreign affairs chief Federica Mogherini said it would be "impossible" and "completely unrealistic" to return to the pre-war status quo after the conflict in which Assad remains president. However, with Haley seemingly intent on dusting off the old Obama-era 'Assad must go' rhetoric, Sputnik decided to look back on the Syrian president's response to such language from years past to get some indication of his expected response. "As for the president, he comes to power with the people's assent through elections, and if he leaves, he leaves if the people demand it, not because of the judgment of the United States, the UN Security Council, the Geneva Conference or the Geneva Communique," Assad said. "I would like to be very clear: no foreign officials might decide the future of Syria, the future of Syria's political system or the individuals who should govern Syria. This is the Syrian people's decision. That's why these statements mean nothing to us." Finally, just two months ago, speaking to Belgian media, Assad again reiterated that if the Syrian were to elect a new president, he would step down immediately. The war, he said, has served as a demonstration of the Syrian people's support for his government. In fact, he noted, his government was dependent on popular support not only at the ballot box, but for everyday governance as well, particularly in the current difficult situation. 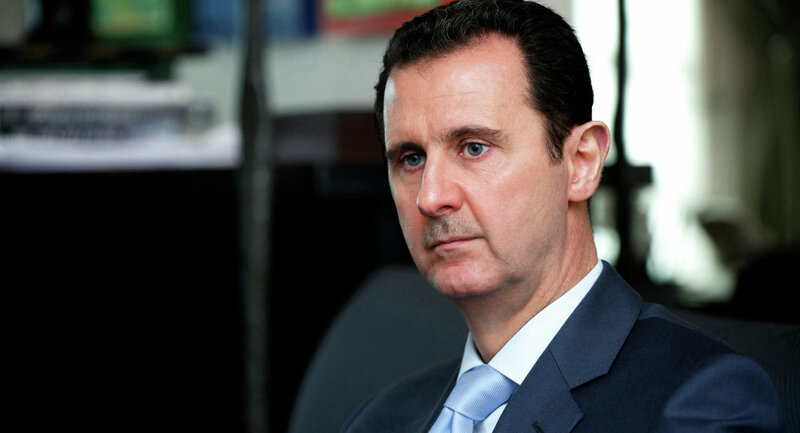 "…If you don't have public support, you cannot achieve anything in Syria, especially in a war. In a war what you need – the most important thing – is to have public support in order to restore your country, to restore stability and security. Without [support] you cannot achieve anything." At the same time, as if to counter Haley's claim that he was a 'hindrance to peace', Assad stressed that achieving peace was about something more than mere negotiations: "How can we stop the flow of the terrorists toward Syria or in Syria? How can we stop the support from regional countries like Turkey, Gulf States, or from Europe, like France and UK, or from the US during the Obama administration? If we deal with that [issue], this is where we can talk about the rest, about the political procedure." Trump's election-era promises to prioritize fighting the terrorists represented "what we've been asking for during the last six years," Assad said. Damascus was now "waiting" to see the practical implications of these promises, he stressed. In other words, even if he doesn't end up commenting directly on Ambassador Haley's recent remarks, Assad has already made clear in interviews going back many years that he's been responding to politicians like her while she was still serving as governor of South Carolina.